Anushka Sharma is once again bringing a new type of film to the big screen with her production company Clean Slate Films. 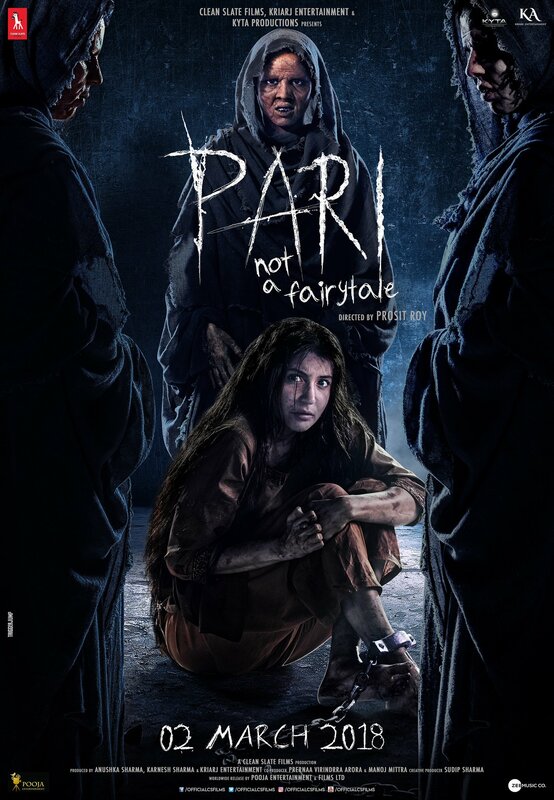 Titled Pari – Not A Fairytale, this film is of the horror genre directed by debutant Prosit Roy, that stars Anushka Sharma, Parambrata Chatterjee, supported by Rajat Kapoor and Ritabhari Chakraborty in pivotal roles. The poster gives you some idea of how scary this will be! We have a bit of an inside look into the story of the film, but this is only a clue! It tells the tale of Arnab and the very mysterious Rukhsana. She ends up at his house one day after… well, you will see why… trembling with fear. She refuses to leave him. Arnab has no option but to keep her. Slowly, he starts enjoying her company. She is strange and mysterious. Their friendship develops but there is something very, very terrifying and very wrong. So does the scary tale move toward a horrifying end? We will find out on March 2nd! We are seriously scared to see more but are very intrigued to see what she will bring to the big screen so we will hold on tight to the edge of our seats and watch Pari on March 2nd! 16 queries in 0.621 seconds.